Posted on Fri, Mar 9, 2012 : 3:21 a.m.
What did you think of the play? Leave a comment at the end of this post. Kathy Waugh and Laurie Atwood in "Grey Gardens"
Surprisingly, the two acts of the stage musical adaptation of “Grey Gardens” - now being staged by Ann Arbor Civic Theater - brought Hannibal Lecter to my mind. Why? Because after seeing “Hannibal,” the sequel to the Oscar-winning “The Silence of the Lambs,” I realized that with “Silence,” when I was left to imagine what made Hannibal the way he is, and what he might do if he was free, the tension was almost unbearable; but watching that same character freely act on his impulses in “Hannibal” was just kind of dull. Similarly, seeing the familiarly uber-eccentric, larger-than-life Little Edie and Big Edie Bouvier Beale - who lived in squalor (with lot of cats and raccoons) in a decaying mansion in East Hampton, and who were the real-life cousin and aunt of Jackie Kennedy Onassis - come to life on stage in “Gardens”’ act two re-creates the haunted air of mystery that drove the original 1975 documentary (the musical’s basis) to become an enormous cult hit. Yet act one - wherein book writer Doug Wright, lyricist Michael Korie, and composer Scott Frankel imagine what the Beales were like long before they lost their fortune - feels like a prosaic, unremarkable origin story that can’t possibly live up to or satisfy the questions raised by the charismatic women forever documented in David and Albert Maysles' film. Even so, director Edmond Reynolds does a pretty fine job with the show, as do his actors. What’s tricky about the role concerns getting laughs without making Little Edie a joke, and Waugh succeeds so well that “Another Winter in a Summer Town” nearly breaks your heart in two, as does the long, devastating moment when Little Edie’s about to leave Grey Gardens, suitcase in-hand, and her mother (Laurie Atwood in another standout performance) calls out to her for help. Lighting designer Tiff Crutchfield, sound designer Bob Skon, props designers Brenda Casher and Martha Montoye, and costume designers Kevin Leistner and Michael A. Gravame (whose one misfire concerned Little Edie’s not-quite-right engagement party dress) helped define the atmosphere of the two and a half hour show, while Leo Babcock’s terrific set design was both evocative and versatile, allowing us to see the Grey Gardens house in its heyday as well as in its ruined, dilapidated state. With lots more costume changes. 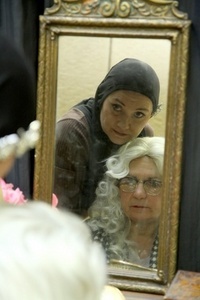 "Grey Gardens" continues through Sunday. Information: www.a2ct.org. Sat, Mar 10, 2012 : 6 p.m. I'm looking forward to seeing this tonight. I can't comment on reviews of the performance (since I have yet to see it), but must respectfully disagree with the view of the play. I had the pleasure of seeing this on Broadway with Christine Ebersole. I had only watched the original documentary the night before, and thought &quot;How the hell do you make a musical out of THIS?&quot; And then I saw this amazing work. Act I is not about Doug Wright's view of the origin story. Every bit of it comes from Big and Little Edie's version of that history. It is not about how they came to be. Far more interesting, it is about how they BELIEVED they came to be. So much of their life was a fantasy built on a few kernels of truth. Act I is a vivid portrayal of that What made the original documentary so fascinating was the viewer's own fascination with the fantasy. Part of it is the fact that these are Kennedy kin living is squalor...&quot;How the once mighty have fallen&quot;...the American version of Schadenfreud. As a stage work I believe the setup of ACT I is critical to the success of the piece. When I first thought to myself &quot;How do they make a musical of THIS&quot;, it is because I was imagining something like ACT II...without the essentila ACT I. Doug Wright was nominated for Drama Desk Award and Tony for the Best Book for a Musical. I would argue the only reason it didn't win is that it was up against Spring Awakening. In case you can't tell, I'm a huge Doug Wright fan, and have to defend his honor on this point. Sat, Mar 10, 2012 : 10:13 p.m.
Keith - Thanks for this. I'm a Doug Wright fan, too, and the task he took on with this show is indeed a mighty one. But even if the origin story IS the one dreamed up by the Beales themselves, I still feel as though the first act of the musical lacks spark. I didn't feel invested or particularly drawn into the lives of the characters at this earlier stage in their life, which raises a question I've been asking since I saw it, and which you raise: the musical had to have more than scenes based on the documentary we all know; but how to do that and make it work is an interesting problem - one I personally didn't feel this creative team necessarily solved. But I'm just one person, of course. Hope you enjoy it! Fri, Mar 9, 2012 : 8:55 p.m.
Fri, Mar 9, 2012 : 7:18 p.m. I have seen the Broadway version of this show - and I really do not understand the 1st 4 paragraphs of this review - and I have re-read them several times. Hannibal &quot;the Cannibal&quot; Lector?? Silence of the Lambs? What do those images really have to do with the Beale sisters ? Also - why waste precious review space trying to explain that unusual analogy with an explanation that is murky and vague at best and really had little to do with the plot of the show? Will readers unfamiliar with Grey Gardens expect Anthony Hopkins to appear in his mask on stage to sing with Little Edie? Also - why would anyone want to read past that depressing beginning to discover (way down in paragraph 5) that you really liked the performances, choreography, lights, sound, props and costumes of this particular production. Fri, Mar 9, 2012 : 7:58 p.m. I really understand and appreciate your clarification to this post, Jenn. I wish you had used that language - which is much more clear and understandable. Hannibal Lecture is a powerful image - and Hannibal was listed as one of the worst, worst movies of that year - that image and language at the top of the review is very very strong. Fri, Mar 9, 2012 : 7:27 p.m.
To clarify, the Lecter comparison attempts to convey that while the '70s version of these women has a tension and mystique that gives the show a memorable spark, the imagined earlier, heyday period depicted in the first act feels flat by comparison. Regarding your last question, the headline communicates that, in my opinion, the people involved did some really good work with the (in my opinion) flawed material they had to work with. Fri, Mar 9, 2012 : 2:07 p.m.
Once again, reviewer Jenn McKee focuses much of her review on her distaste for the script and musical score of a Broadway-produced musical in a way that taints the positive remarks she has for it. A large cast and crew of Ann Arborites that have donated so much time and energy in the last several months to bring this show to a local stage at an affordable ticket price. Doug Wright and Scott Frankel will never read this review, but all the dedicated cast and crew, as well as potential patrons, are certain to. McKee might serve the readers of annarbor.com better to focus on the quality of the local production first, and add her own (brief) opinions on the script/score lastly. I, for one, was proud to be a part of such a great team and am happy to see the Ann Arbor Civic Theatre once again bring a little piece of Broadway to the Arthur Miller Theater here in town. Fri, Mar 9, 2012 : 6:37 p.m. It is a shame. When did the focus of reviews turn from the actual performance to the origin of the show? Isn't that sort of what the Preview is for?